I wonder how much it would cost to extend the additional two tracks from Homebush to Granville, which was a recommendation as a long term option in the original Christie Report, and which would complete sectorisation between the Main South and Western Lines ? How can it be a lack of maintenance? 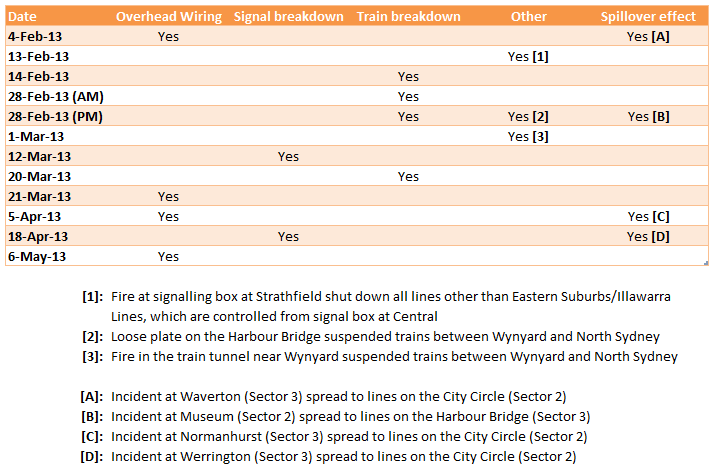 Some of these incidents happened in sectors that had just been down for trackwork on the weekend prior. (Incidents A & B). Not sure about C & D.
This also shows the need for another harbour crossing, the city circle barely seems to function at 3 minute headways, let alone when trains are bunched up after major delays occur. Based on the $400m/km the NWRL tunnels are estimated to cost, the approximately 8km between Granville and Homebush would cost around $3.2bn. Ultimately this amplification appears quite expensive when a similar capacity improvement can be achieved elsewhere, while also improving mobility in other parts of Sydney. That’s why even the Christie Report didn’t expect it to be built until possibly as late as 2051, and Christie was very ambitious. I think the argument here was that it was poorly performed maintenance that may have led to trains’ pantographs getting tangled up in the overhead wires. I don’t know the details, they haven’t been released as far as I know (and based on media reports, it seems not even the Transport Minister knows). But when there are issues with overhead wires right after track work was performed there, and this happens repeatedly, then questions do get raised. I was thinking more of a surface extension rather than a tunnel option. This would have to be far less expensive, notwithstanding the land resumption required. A considerable part of it would be located within the existing rail corridor. As far as capacity improvements on the Western Line go, with the opening of the Epping to Chatswood Rail Link (ignoring the Parramatta to Epping Rail Link which I don’t think will ever be built), what has been overlooked to accommodate this, is the deterioration of services on the Northern Line in the peak from Epping to the CBD via Strathfield, which is now one of the most congested on the CityRail network. The major stations on this section of the Northern Line, Eastwood and West Ryde, have had their peak hour services halved from eight to four following the opening of the Epping to Chatswood Link and now with the major development in Rhodes, it’s little wonder that this line is so congested. With proposed urban consolidation in Eastwood and West Ryde and further development in Rhodes and Meadowbank, this congestion is only going to be exacerbated without the restoration of the previous peak hour services, which at present are not possible unless they use the Main Line tracks to terminate at Central. My argument is that further sectorisation, such as a Homebush to Granville link (and I might add an Erskineville to Sydenham link) , would be far more beneficial to the operational efficiency of the CityRail/Sydney Trains network than trying to convert parts of the network to so called “rapid transit”, including the North West Rail Link, which would completely destroy the sectorisation concept. The additional two tracks from Homebush to Granville would be exclusively for the South Line (via Regents Park and Granville, assuming the former continues to operate to Liverpool and beyond) and would have nothing to do with the Western Line, thereby providing a completely separate sector. The Homebush and Lidcombe turnbacks would become redundant and the loop service for the Inner West and Bankstown Lines could be reinstated. The Western Line Local tracks service the Richmond Line and generally all stations stopping patterns, while the Western Line Main tracks service Intercity and Western Express services, with the latter eventually crossing over to the Suburban tracks at Homebush or Eveleigh Junctions. This crossover could be avoided in the future if the Main Line tracks were linked to a new CBD Rail Link and second harbor crossing from Eveleigh. You’d still need some sort of amplification to connect the “mains” to the city centre with longer platforms, and then why do you need to have a quad for the Western Line? Isn’t a single track pair enough, so long as particularly Auburn passengers are removed and longer trains used? The SWRL is surely going to run down the East Hills line with it’s almost complete Kingsgrove to Revesby amplification. Re-instating the Bankstown Loop will bring back the problem that all loops face and that is a stop must be made somewhere to regain the timetable. The timetable for a loop must have extra time allowed so that late running will only upset one service and not carry on for the whole day. The Kingsgrove to Revesby Quadruplication has already been completed and is currently in use. I take your point Simon, but I reiterate that my argument is to completely separate South Line services from Western Line services, thereby avoiding shared track space between Homebush and Granville, and enhancing the sectorisation concept. I don’t think a single track pair for the Western Line is enough, when you consider that it has to cater for Western all station services, the Richmond Line (which is going to increase dramatically with the development of the North West growth area), express services from Penrith/Emu Plains and Blue Mountains Intercity services. At least in the foreseeable future it also has to cater for Western freight trains as far as Flemington. The same problem applies to the Northern and Illawarra Lines with the mix of services. I acknowledge that the previous government’s Western Express proposal envisaged 10-car trains, with only limited station stops, but I don’t think this is practicable. The current 8-car Intercity V sets require much longer platforms than a standard 8-car suburban set, but there only a few stations in the suburban area that can accommodate them. Keep It Simple Stupid is my motto, stick with what we’ve got. As for amplification to connect the “Mains” to the city centre, I did say that there would need to be a link from the “Mains” at Eveleigh to a new CBD Rail Link (preferably via the Pitt Street corridor) and second harbor crossing, perhaps shared with a link from the current “Illawarra Local” tracks (which in turn would be shared with the new East Hills Line express tracks). This could best be achieved by a dive from the “Mains” immediately north east of Macdonaldtown station, going under the Illawarra Dive, and junctioning with the “Illawarra Local” tracks just before the unused surface platforms 9 & 10 at Redfern. It would then proceed from Redfern to the unused underground platforms 26 & 27 at Central before following the Pitt Street corridor to the second harbor crossing. I realise this is at odds with the government’s proposed conversation to “rapid transit”, but that is a long way off and governments change. WEX envisaged 10 car trains initially expanding to 12 car trains in the future. I’m quite sure Strathfield 2/3, Parramatta 1/2, Blacktown’s double island and Penrith can handle at least the 10 car trains. It would be a matter of rebuilding platforms starting with Rooty Hill to Werrington. I don’t get why everyone is so focussed on using Metro Pitt. Metro West is easier to access for the Western Line and allows service nearer to the Barrangaroo development. As for a single track pair being enough for the Western Line, well it would be at present, but I’m inclined to agree that it may not be forever. Future growth is best handled by the sextup to Lidcombe sending more passengers via Regents Park, and using the outers Westmead-7Hills for the Harbour Bridge lines (sector 3). Once you get here the sextup Strathfield-city is starting to look in trouble so an additional sector is likely to be needed. It’s all very well to say that 10 or 12 car trains were proposed for the WEX, but that only envisaged a terminus at Wynyard and not a connection to the North Shore via a second harbor crossing. If such an extension eventuated, while extended platform lengths could be built for the interim stations between Wynyard and St Leonards, it might present a problem for Chatswood and the link to Epping and beyond to the North West Rail Link (whether it be for a rapid transit link or the existing CityRail network). Before Railcorp relinquished its planning functions to Transport for NSW, the preferred option for a new CBD rail link was for the Pitt St corridor because it was more centrally located through the city spine and serviced a far greater patronage. Notwithstanding the development in Barangaroo, I believe that this is still the case. In the medium term, Barangaroo could be serviced by an extension of the CBD Light Rail. In the longer term, I would prefer to see the Metro West corridor through Barangaroo reserved for a future separate Sydney Metro Network linking the previously proposed Western Metro Line with a Northern Beaches Metro Line. This would necessitate a 4 track second harbor crossing, shared with the Pitt St corridor, although the Metro Line would not be operational until some time in the future. But isn’t it time we had some long term visionary planning in this city, instead of pandering to the short term electoral cycle? With regard to the Western Line, I concede that a sextup from Homebush to Lidcombe would be a good interim measure, giving some relief for western services. Ideally in the longer term, this could be extended to Granville to completely separate South Line services from the Western Line. I see what you are saying, but what about the point that sextup Strathfield-city would be limiting capacity before the quad Lidcombe-Granville provides any actual limits? I would expect that a new CBD Rail Link and second harbor crossing (putting aside the government’s current proposal for a rapid transit link) would have priority over a Lidcombe-Granville sextup and once the former is in place, provided there is a link from the “Main” lines at Eveleigh as I previously alluded to, there should be sufficient capacity on the sextup from Strathfield to the CBD. Let’s analyse that some more. Gladys has directed that there be 2 more trains per hour on the lower Northern Line. Given that the upper northern line has to return to via Strathfield with the NWRL, that will have to match the frequency, I expect or have a very random timetable. So 12tph from the north on the sextup. South and Inner West have around 13tph between them, but one has to assume that these lines will grow their patronage. At a minimum, that uses up 1.25 track pairs. There isn’t much room for growth on the sextup given that there is already 20tph from the west, including blue mountains. Only 0.75 track pairs are free for growth, allowing for 33% total growth. That would be blown in 15 years of 2% peak patronage growth! WEX really was the best plan. Gladys’ is a lemmings’ plan. I cannot put into words how much I despise and loath it. A simple journey on a train looking out of the window, shows that this is not the case. There is ample room at almost all places along the railway corridor between Homebush and Granville for 2 more tracks. Auburn is easily solved by having only one pair of platforms there and servicing it with the South line or the western line, not both. And Lidcombe can also be solved, although it is a bit more tricky. It is ABSURD to comtemplate spending tens of billions of dollars on very long tunnels, and then to complain about “prohibitive” land acquisition costs for a surface option.